Guru Dorje Drolö (Tib. གུ་རུ་རྡོ་རྗེ་གྲོ་ལོད་, Wyl. gu ru rdo rje gro lod; Eng. 'Wild Wrathful Vajra') is one of the Eight Manifestations of Guru Rinpoche—Guru Rinpoche in wrathful form riding upon a pregnant tigress. He assumed this manifestation in Paro Taktsang in Bhutan in order to bring the local deities and guardians under his control. At thirteen different places called 'Tiger's Lair', Taktsang, Guru Rinpoche manifested in "the terrifying wrathful form of crazy wisdom", binding worldly spirits under oath to protect the terma treasures and serve the Dharma. 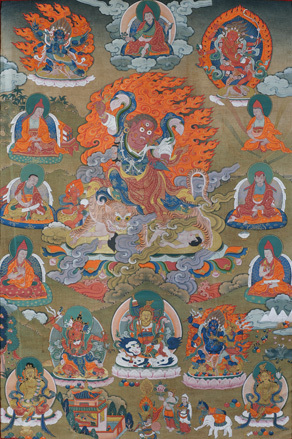 Then he is known as Dorje Drolö, 'Wild Wrathful Vajra'. Chögyam Trungpa, Crazy Wisdom, The Collected Works of Chögyam Trungpa, Volume Five (Boston & London: Shambhala, 2004), Crazy Wisdom Seminar I: Jackson Hole, 1972, pages 49-52 & Crazy Wisdom Seminar II: Karmê Chöling, 1972, Ch 7. Dorje Trolö and The Three Styles Of Transmission, pages 134-146. This page was last edited on 28 January 2017, at 18:57.